DSC and its forebears have of course been used to writing about Audis and Harriers for many years but Thursday saw something altogether different on that front. Whilst the Audi in question was the R10 TDi engined LMP1 prototype that is currently sweeping all before it, the Harrier was somewhat different to the Lester Ray designed, Ford Cosworth engined machines we’re more used to. Rather it was a Roll Royce Pegasus engined, GR7 Ground Attack aircraft from the Royal Air Force's 20 Squadron at RAF Wittering. 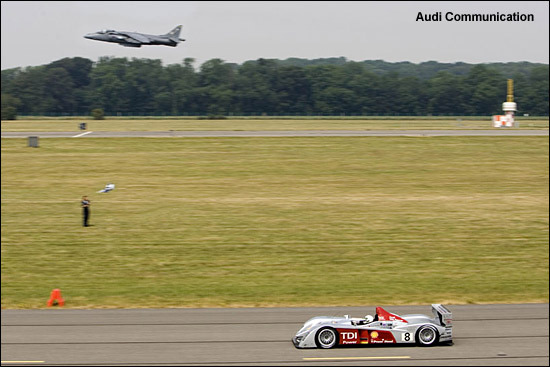 It was to be a straight test of sprinting speed over a one kilometre course between the R10, piloted by Audi 'Top Gun' Allan McNish and the Harrier GR7 literally piloted by one of the RAF’s finest. 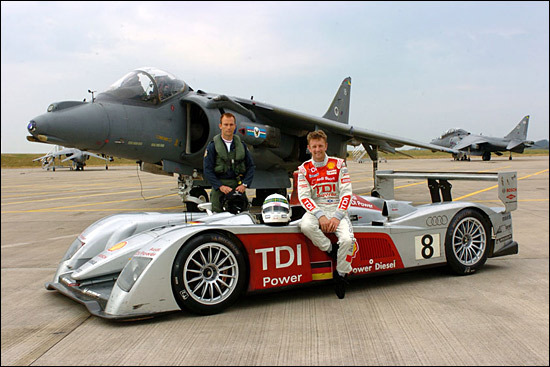 Despite an unaccustomed standing start, McNish grabbed an immediate lead in the 650 bhp Audi and held it until just before the finish line when the power of the Pegasus engine finally told, the Harrier winning it by a (radar equipped) nose. The Harrier of course had something of an ‘edge on the power front – 23,800 lb/foot of thrust told in the end – But maybe, just maybe McNish didn’t want to take the win? After all would you like to be on the ground in a brightly coloured object with a fast jet above you equipped with a couple of Mavericks and a pilot not looking forward to explaining the loss to his mates in the mess? 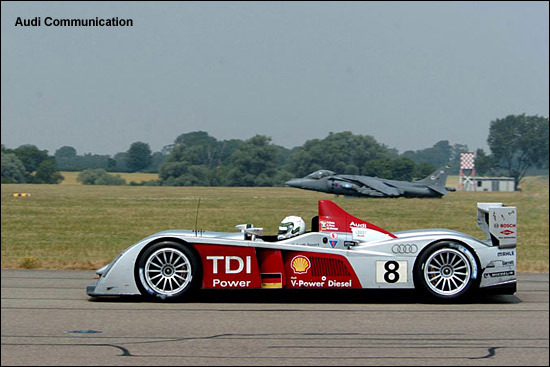 Joking aside though it showed very clearly the power and torque of the R10, The Audi’s talents will next be on show this weekend at the Goodwood Festival of Speed, again with McNish at the wheel, before two R10s resume their attack on the American Le Mans Series later this month.